"A rare opportunity to learn from one of the most renowned industry pro Television"
PRODUCTION ON is the program where students are being trained for their successful prospect. It will be include Practical Training. to do something in media feild. a: Understanding the broadcast system of Pakistan. 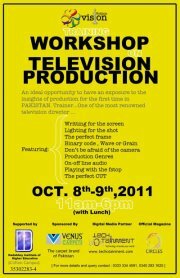 d: Types of Productions in Pakistan. e: Concept, Script and AV board. f: Exercise on script writing. g: White and Black Balancing a shot. d: Audio recording in different types of productions.